South Korean President Moon Jae-in and North Korean leader Kim Jong-un embarked on a rare trip Thursday to Mount Paekdu in an event designed to enhance their personal ties and also highlight the success of their summit in Pyongyang. The leaders left Pyongyang's Sunan International Airport shortly after 7 a.m., each using his own presidential jet. 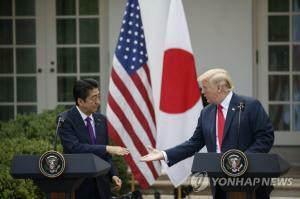 U.S. President Donald Trump said Wednesday that there has been "tremendous progress" with North Korea following another summit between the two Koreas' leaders. South Korean President Moon Jae-in and North Korean leader Kim Jong-un met in Pyongyang on Tuesday and Wednesday and jointly reaffirmed their commitment to make the peninsula free of nuclear weapons. South Korea's parliament is set to hold a plenary session Thursday to vote on key bills, including a proposal aimed at easing nonfinancial firms' ownership cap in Internet-only banks. The National Assembly is scheduled to convene at 2:00 p.m. to deliberate on a set of bills on the economy and deregulation amid calls for lawmakers to spur legislative efforts to prop up the slowing economy. South Korean President Moon Jae-in and North Korean leader Kim Jong-un departed for a rare trip to Mount Baekdu on Thursday on the last day of Moon's three-day visit to Pyongyang. Moon left for Samjiyon airport near the North Korean mountain at around 7:30 a.m. on Air Force Two. Kim is also expected to arrive at the airport using his own presidential jet. The two leaders plan to reach the peak and visit the famous crater lake at the top called Heaven Lake or “Chonji,” depending on the weather. U.S. Secretary of State Mike Pompeo said Wednesday that the U.S. is prepared to "immediately" engage in talks with North Korea following the third summit between the leaders of the two Koreas in Pyongyang. Pompeo made the remarks in a statement, welcoming the North's decision to permanently dismantle its missile engine test facility in Dongchang-ri with experts from relevant countries participating. South Korea’s presidential office says the leaders of South and North Korea have virtually declared to end the Korean War through the latest inter-Korean summit. Chief presidential press secretary Yoon Young-chan made the assessment on the September 19th Pyongyang Declaration reached during the summit talks in the North Korean capital between President Moon Jae-in and North Korean leader Kim Jong-un during a media briefing in Seoul on Wednesday. A South Korean steel product has been exempted from U.S. tariffs for the first time since Washington imposed an import quota on South Korean steel months ago, industry sources said Thursday. The U.S. Commerce Department on Monday accepted a request from American medical equipment maker Micro Stamping to exclude superfine stainless steel tubes made by South Korea's SL tech. North Korean leader Kim Jong-un's renewed commitment to denuclearize, expressed at this week's meeting with South Korean President Moon Jae-in, fanned expectations Wednesday of a second summit between the reclusive leader and U.S. President Donald Trump. The White House said early last week that Trump had received a letter from Kim, in which the North Korean leader requested a second meeting between the two. Planning for that meeting was already under way, according to the White House press secretary. South Korean President Moon Jae-in and North Korean leader Kim Jong-un embarked on a rare trip Thursday to Mount Paekdu in an event designed to enhance their personal ties and also highlight the success of their summit in Pyongyang. The leaders left Pyongyang's Sunan International Airport shortly after 7 a.m., each using his own presidential jet. Moon arrived in Pyongyang on Tuesday, using his Air Force One. The United States is prepared to "immediately" engage in talks with North Korea, US Secretary of State Mike Pompeo said Wednesday, signaling a breakthrough in stalled negotiations to dismantle the regime's nuclear weapons program. North Korean leader Kim Jong-un reaffirmed his commitment to a nuclear weapons-free Korean Peninsula during his third summit with South Korean President Moon Jae-in earlier in the day. South Korean President Moon Jae-in was set to return home Thursday, ending his historic trip to North Korea aimed at brokering a resumption of denuclearization talks between the North and the United States. Moon's trip home will follow a joint excursion with North Korean leader Kim Jong-un to the North's Mount Paekdu, the tallest mountain in Korea that sits on the border with China. South Korean President Moon Jae-in and North Korean leader Kim Jong-un embarked on a rare trip Thursday to Mount Paekdu in an event designed to enhance their personal ties and also highlight the success of their summit in Pyongyang. The leaders left Pyongyang's Sunan International Airport shortly after 7 a.m., each using his own presidential jet. Moon arrived in Pyongyang on Tuesday, using his Air Force One. For his trip to Mount Paekdu, however, he was forced to use the smaller Air Force Two as Samjiyon airport near the North Korean mountain is said to have a short runway that can only land small aircraft. The United States is prepared to "immediately" engage in talks with North Korea, U.S. Secretary of State Mike Pompeo said Wednesday, signaling a breakthrough in stalled negotiations to dismantle the regime's nuclear weapons program. North Korean leader Kim Jong-un reaffirmed his commitment to a nuclear weapons-free Korean Peninsula during his third summit with South Korean President Moon Jae-in earlier in the day. Kim also said following the two-day meeting in Pyongyang that he was ready to dismantle a missile testing site in front of international inspectors and, if the U.S. took reciprocal steps, a key nuclear facility. South Korean President Moon Jae-in watched a controversial mass gymnastics performance in Pyongyang late Wednesday on the second day of his trip, alongside North Korean leader Kim Jong-un. As the two leaders entered the May Day Stadium, the venue of the performance, together at about 9 p.m, some 150,000 Pyongyang citizens cheered and gave them an emotional standing ovation. The cheers became louder when Moon waved his hands toward the crowd. The leaders then sat down and began watching the performance. President Moon Jae-in and North Korean leader Kim Jong-un at a joint press conference on Wednesday announced a range of agreements that fell short of a substantial breakthrough in denuclearization efforts. 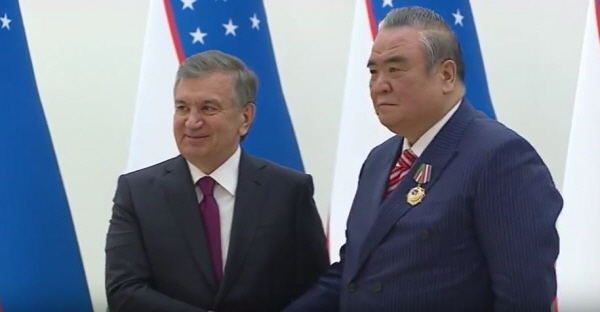 After a private meeting without officials at the North's state guesthouse, Paekhwawon, the two leaders signed an agreement to reduce military tensions and prevent any accidental clashes in the border areas. Moon said he invited Kim to visit Seoul and Kim agreed to come at his earliest convenience. 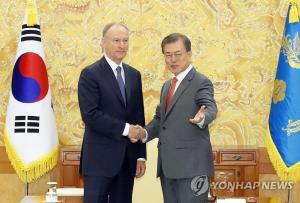 Moon explained later that the visit will happen this year unless there are any unexpected obstacles. The U.S. government continues to voice unease over inter-Korean economic cooperation that could weaken international pressure on North Korea to denuclearize as President Moon Jae-in flew to Pyongyang for a summit. The U.S. State Department said Monday that Secretary of State Mike Pompeo spoke over the phone with Foreign Minister Kang Kyung-wha. "They discussed... President Moon Jae-in's upcoming summit with... Kim Jong-un. In addition, Secretary Pompeo and Foreign Minister Kang vowed to maintain close coordination on continuing... denuclearization efforts and inter-Korean dialogue and cooperation." President Moon Jae-in and North Korean leader Kim Jong-un on Wednesday watched a performance of the North’s notorious mass games together. Entitled "Glorious Country," it brought together thousands of performers at the May Day Stadium in Pyongyang who threw shapes in queasy unison and formed giant pictures with pieces of colored cardboard. As the two leaders entered the stadium together, the 150,000 spectators erupted in equally choreographed applause. On Sept. 19, South Korean President Moon Jae-in and North Korean leader Kim Jong-un jointly announced the September Pyongyang Declaration, which includes an agreement by North Korea to permanently shut down its missile engine test site and launch pad at Dongchang Village. The agreement also includes a promise to shut down the Yongbyon nuclear facility, depending on corresponding measures from the US. Furthermore, Kim agreed to visit Seoul for a fourth inter-Korean summit within the year given that no special circumstances arise. After signing the September Pyongyang Declaration Agreement at the Paekhwawon Guest House, Moon and Kim held a joint press conference. South Korean President Moon Jae-in made remarks on Sept. 18 expressing “gratitude for [North Korean leader] Kim Jong-un’s decision to open up a new era.” Speaking in introductory remarks ahead of a third inter-Korean summit that day at the Workers’ Party of Korea (WPK) headquarters in Pyongyang, Moon noted, “This is our third meeting in five months.” “In retrospect, we have had the Pyeongchang Winter Olympics and Chairman Kim’s New Year’s address before that, and that New Year’s address included a bold decision by Chairman Kim,” he said. North Korean leader Kim Jong Un will be visiting Seoul. If his visit to South Korea were to be arranged, it will be the first visit by the highest-ranking leader of North Korea to visit Seoul since the ceasefire in 1953. 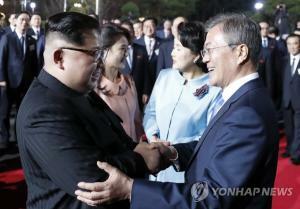 On Wednesday right after the summit at the reception hall of Baekhwawon, South Korean President Moon Jae-in and Kim Jong Un announced at the Pyongyang Joint Declaration that the North Korean leader decided to visit Seoul in the near future at the invitation of Moon. President Moon explained that the phrase "near future" here means "within this year" unless there is a particular situation. Kim's visit to Seoul is a return visit to President Moon’s visit to Pyongyang this time. Samsung Electronics is selling its medical equipment company to Japan. Jun Dong-soo, head of Samsung Electronics’ medical device unit and CEO of Samsung Medison, reportedly told his employees at a briefing on Wednesday on the sales of in vitro diagnostics (IVD) business. “We’re in the process of reviewing transferring our IVD business to a Japanese company specializing in IVD devices,” Samsung Electronics said. “We’re planning to focus on diagnostic medical imaging as the synergistic effect between IVD devices and our business is limited.” The IVD are medical devices that help diagnose diseases using blood samples. Samsung’s IVD business accounts for 15 percent of the total revenue of its medical device unit. The South Korean tech giant manufactures diagnostic medical imaging devices, such as X-rays, CT scans, and MRIs, as well as IVD device. When searching for the phrase "How to purchase a house in Turkey" in Persian at an Internet portal site, one would find tens of pages. These are all advertisements that offer to introduce methods to purchase real estate in Turkey or acquire a sojourn visa easily. This is a case in point that demonstrates the increase in the number of young people in Iran who are determined to "escape" abroad as the domestic economy is suffering due to long-standing economic sanctions against the country. South Korean President Moon Jae-in and North Korean leader Kim Jong-un agreed to halt all military acts that could spark conflict along the border, promising to end confrontational relations and the threat of war on the Korean Peninsula. The two leaders on Wednesday also reaffirmed their commitment to a nuclear free Korean peninsula with North Korean leader Kim promising to invite foreign experts to verify the dismantling of a long-range missile engine testing site. He also offered to shut down the country’s most important nuclear facility - if the United States offers “corresponding measures” in return. U.S. President Donald Trump immediately welcomed that North Korean leader Kim Jong-un agreed to allow inspections of his nuclear sites through the Pyongyang Declaration signed Wednesday. Trump tweeted, a little over an hour after the announcement, that Kim “has agreed to allow Nuclear inspections, subject to final negotiations, and to permanently dismantle a test site and launch pad in the presence of international experts.” Much hinged on the substantive outcome of South Korean President Moon Jae-in’s third summit with Kim in Pyongyang, as it is expected to help advance the impasse in the North-U.S. denuclearization dialogue. Hopes that tourism to North Korea’s Mount Kumgang and the operation of the Kaesong Industrial Complex will soon resume have been raised as the leaders of both Koreas agreed to normalize the businesses in the Pyongyang Declaration signed Wednesday. “As soon as related conditions are prepared, we will proceed with normalization of Kaesong Industrial Complex and tourism in Mount Kumgang as well as formation of joint economic zones in the west and east seas,” read the agreement signed by President Moon Jae-in and North Korean leader Kim Jong-un on the second day of their summit in Pyongyang. President Moon Jae-in and North Korean leader Kim Jong-un launched the third inter-Korean summit in Pyongyang. On September 18, the two leaders attended a welcome ceremony at the Pyongyang International Airport, a summit meeting, a performance, and a dinner and discussed denuclearization as they went through the day's schedule. 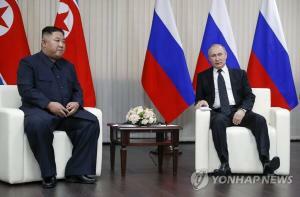 The two men talked for two hours at the Workers' Party of Korea headquarters, where Mr. Kim's office is located. In his opening remarks, President Moon said, "I hope this summit will bring about rich fruits as a Chuseok gift to the 80 million Korean people," and expressed his expectation. Mr. Kim replied, "It is no exaggeration to say that the historical meeting of (the leaders of) North Korea and the United States was possible thanks to President Moon," and said, "I expect this to stabilize the political situation in our surrounding region, and bring forth more progress." The historical meeting to seek a breakthrough in the denuclearization negotiations between North Korea and the U.S. is off to a smooth start. 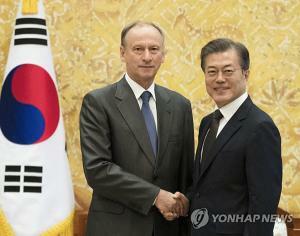 On September 17, the floor leaders of the Democratic Party of Korea, the Liberty Korea Party and the Bareun Mirae Party agreed to pass an Act on Special Cases Concerning Regulations on Internet Banks, which greatly eased regulations separating banking and commerce--put in place to restrict industrial capital from owning banks--in a parliamentary session on September 20. At the center of the latest revisions is the higher limit for voting shares of Internet banks owned by industrial capital--the ruling and opposition parties agreed to raise the current 4% to 34%. However, they decided to include an article in the enforcement decree preventing companies with assets of over 10 trillion that are blocked from cross-shareholding (chaebol) from owning Internet banks, while allowing companies with over 50% of their assets in the information and communications technology (ICT) industry, like Kakao and KT. President Moon Jae-in and Kim Jong-un, chairman of the North Korean State Affairs Commission will hold the third inter-Korean summit in Pyongyang on September 18. President Moon's trip to North Korea will be the third following presidents Kim Dae-jung and Roh Moo-hyun. Compared to the trips by the two previous presidents, President Moon will not be traveling to Pyongyang with a light heart. At the summit in 2000, nuclear weapons were not an issue, and in 2007, President Roh was able to concentrate on inter-Korean relations for the direction was already set toward denuclearization at the six-party talks and in a follow-up agreement between North Korea and the U.S. But this time, denuclearization lays heavy on the president's shoulders. In addition, international conditions are not so sunny with the United Nations Security Council holding an emergency meeting to discuss the implementation of sanctions on North Korea on the first day of the president's trip to North Korea. In an effort to accelerate cross-border exchanges and economic cooperation, the two Koreas agreed to make a joint bid for the 2032 Summer Olympic Games and reopen a suspended industrial zone and tour programs if things get better. At a summit in Pyongyang, South Korean President Moon Jae-in and North Korean leader Kim Jong-un agreed to break ground for a joint project to connect cross-border railways and roads border before the year's end. They will seek to jointly host the 2032 Olympics. South Korean President Moon Jae-in will have a special night out Wednesday to watch a mass acrobatic, dance and gymnastic performance, which was once listed in Guinness World Records as the largest event of its kind and involved tens of thousands of school children. The one-hour performance titled "The Glorious Country" will slightly change its content to welcome Moon, his office said in Seoul, adding the South Korean leader would deliver a speech before some 150,000 people. At an inter-Korean summit, North Korea agreed to consider shutting down its main nuclear complex after the permanent dismantlement of facilities for ballistic missile launches and engine testing in a bid to spur dialogue with the United States on denuclearization. The proposed dismantlement of facilities in the North's Sohae space center that played an important role in the development of intercontinental ballistic missile (ICBM) technologies was the backbone of an agreement signed by South and North Korean leaders at their summit in Pyongyang. South Korea’s leading automaker Hyundai Motor Co. will make a strategic investment in Swiss-based technology company Wayray to develop holographic augmented reality (AR) navigation system, the company announced Wednesday. Although the car maker did not disclose the exact amount of its investment, it aims to install the AR navigation system to its vehicles starting 2020. The global market for hologram displays, which create a virtual three-dimensional image of an object, is projected to grow by 30 percent per year to reach $3.6 billion by 2020. South Korea’s leading LPG supplier SK Gas Ltd. will spend 2.02 trillion won ($1.8 billion) to build a combined-cycle power plant and polypropylene (PP) plant in the southeastern industrial city of Ulsan, Korea. 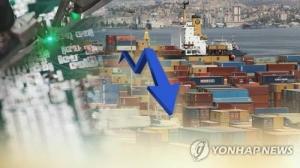 The Korean company said Wednesday it signed a deal with Ulsan city government and Ulsan Port Authority to build the two facilities and invest in new businesses such as renewable energy and energy storage systems.